As an increasing number of drugs gain approval for patients whose cancers have certain molecular characteristics, the promise of truly personalised medicine is edging closer towards reality. However, the realisation that every patient's cancer is different - and that these differences can be detected with in vitro diagnostic tests and exploited with tailored therapies - has led to a rapid fragmentation of the anti-cancer drug landscape. This, in turn, has led to a significantly more complicated decision-making process for oncologists. Molecular diagnostics testing is at the far end of a long and evolving spectrum of narrowing down the nature of a disease. This starts with the clinical observation of (often visual) symptoms, moves on to more advanced visualisation techniques involving x-rays and other imaging machinery, pulls in pathologists and their microscopes to examine the overall cell structure, involves dyes and stains to quantify the expression of certain markers on cell membranes, and finally moves deep within the cell nucleus to look for specific changes in the cancer's DNA. DNA changes can only be detected with sophisticated machinery that relies on advanced techniques such as real time polymerase chain reactions (PCR) and, increasingly, full gene sequencing. Despite the obvious advantage of identifying patients for whom specific targeted therapies are most likely to lead to a good response, the growing number of companion diagnostics is causing ever-increasing levels of complexity. This has potentially profound effects, from hampering the uptake of certain drugs, to patients not receiving therapies that could be of benefit to them. This delicate balance between companion diagnostics' clinical utility and their potential confounding impact on patient treatment is a growing dilemma. Predicting response: perfection or guesswork? The first and biggest question concerning companion diagnostics is, do they increase a drug's usage due to its demonstrably superior effects in a specific patient population, or do they limit a drug's uptake due to the exclusion of (often large) groups of patients who lack the required biomarker status? Answering this question in full requires a scientific journey to better understand what a companion diagnostic test is measuring. That is outside the scope of this article, but the key point is this: because companion diagnostics often measure non-binary indicators, such as protein expression levels, cell surface receptors and gene amplification, they do not always yield definitive yes/no answers. What's more, results are further affected by method of measurement and brand of test and, currently, these are many and varied. In other words, CDx testing and the treatment decisions that result are subject to a degree of interpretation, either by the pathologist or the oncologist or both. Although this complex field is constantly evolving alongside our own understanding of disease and human genetics, it is not yet an exact science. However, doctors' stated perceptions of these tests and observed testing behaviour strongly suggest that a marker does not have to be perfect for it to be useful for making informed treatment choices. For many doctors, the fact that some patients may miss out on a drug that could potentially work for them is more than compensated for by the fact that the patients they do prescribe the drug to are more likely to benefit as a result of their biomarker status. Targeted therapies carry a significant financial cost, and sometimes come with potential side effects. Having a tool (biomarker) to help make a benefit vs. cost assessment is generally seen as a positive attribute. It should be pointed out that, ultimately, this type of assessment is carried out at a much higher level by authorities such as the FDA when it comes to making a decision on drug approval. Based on all the available clinical trial data to date - including response rates in specific sub-types - the approval bodies must decide whether it is better for the drug to be approved for all patients (and hence risk additional expenses/toxicities from these drugs in patient groups that have low probability of gaining a benefit) or only in patients with certain mutations/overexpression profiles (and hence risk excluding a potentially large percentage of the population for whom a small, but non-zero, likelihood of benefit exists). In all this, it should be noted that the relative importance of each of these factors in this intricate balancing act can be very different depending on whose point of view you consider: the patient, the physician, the drug manufacturer, the payer or the government. Despite the increasing fragmentation and growing number of clinically meaningful markers, the current state of molecular diagnostics cannot yet be considered true personalised medicine - but this is all about to change. This transition period of single-marker testing is a necessary, but likely brief, stepping stone towards mass profiling/sequencing of large numbers of genes, and making treatment decisions based on patients' detailed genetic profiles. Next Generation Sequencing has been gradually increasing in use over the past few years, and is getting close to being widely adopted. Also known as massively parallel sequencing or high-throughput sequencing, it allows many different genes - often in the hundreds - to be sequenced in one run, making it much more efficient than existing techniques. 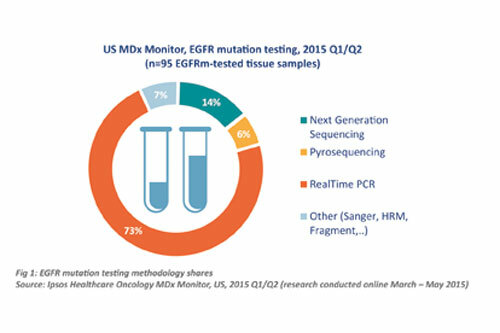 While more established methodologies still dominate, Next Generation Sequencing is starting to make an impact in the Oncology CDx world, as this breakdown of methodologies used for EGFR mutation testing in the US illustrates (Figure 1). There have been two major barriers to widespread adoption of NGS in the past: (1) its cost; and (2) its clinical utility. The first barrier is rapidly disappearing, as the cost of NGS is decreasing significantly each month. The second barrier is harder to address, and comes down to the fact that many of the genes profiled through NGS panels have not yet been extensively studied in clinical trials, leaving doctors unsure as to what to do with all that data. Cancer is, ultimately, a genetic disease: it is always caused by genetic changes. We cannot hope to conquer cancer unless we fully understand the intricate relationship between the myriad genes and proteins that control the cell cycle and which, through random mutations, can and do lead to malignancies. As we uncover more and more of these genes and proteins, we are starting to realise that they hold the key to successful treatment: no two cancers are the same, and their subtle differences can only be identified by probing deep into their submicroscopic worlds. 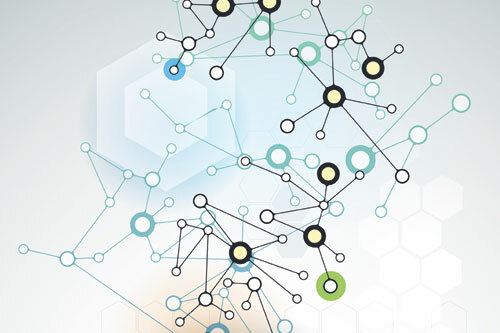 The tools that enable us to do so are constantly evolving, allowing us to map those molecular differences more efficiently, in much larger numbers, less invasively and more accurately. It is easy to become overwhelmed by this flood of new data, new techniques, new methodologies, new targets and even entirely new paradigms. This is a challenge not just faced by oncologists and pathologists, but also by those researching, developing and marketing new targeted anticancer therapies. Drug manufacturers now operate in a very different world from just a decade ago, and a solid CDx launch strategy is of vital importance. Such a strategy must ideally incorporate all the new advances, anticipate the upcoming revolutions and ensure being a prescription driver - rather than a barrier - by navigating the ever-increasing complexity. Cancer is complex and an understanding of this complexity leads to opportunities: for doctors, for drug and diagnostics manufacturers and - most importantly - for patients.